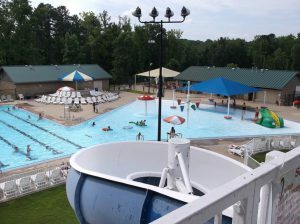 Arkadelphia Aquatic Park located in Arkadelphia, Arkansas, is one of the city’s main tourist attractions. Enjoy a refreshing 8-lane, 25-meter swimming area with a diving area that includes a 1-meter springboard. It features more than a dozen water features including an umbrella style water fountain, three floating play pieces, four arching sprays and three different water slides. The drop slide is a closed tunnel, high speed slide that plunges downward for maximum impact. The open flume water slide is full of twists and turns for topsy-turvy fun before plunging into the water. The frog slide is geared toward smaller children . The park has several life guards on duty and is fun and safe for all ages. Enjoy music while you zip down fun-filled water slides or sunbathe on the grassy area in a lounge chair. The park has concessions and shaded picnic areas so you and your family can enjoy lunch or a fresh, cool drink. Arkadelphia also offers swimming lessons. In 2004, it was given the top facility award by the Arkansas Recreation and Parks Association. Note to our visitors: Events and specials at Arkadelphia Aquatic Park can change without notice. So please visit their official website to make sure of the latest pricing and coupons.